The effort to oust twice-elected Brazilian President Dilma Rousseff has been big news in the United States. Since December 2015, when Brazil's Chamber of Deputies began an impeachment process over Rousseff's budget maneuvers, the New York Times has had 74 pieces that mention "Rousseff" and "impeachment," according to the Nexis news database; the Washington Post has had 138 such stories. But something that hasn't been big news in US corporate media has been the reaction from Brazil's neighbors to Rousseff's suspension pending a Senate trial. While some Latin American governments were supportive -- notably, newly right-governed Argentina said it "respects the institutional process" in Brazil, while close US ally Colombia "trusts in the preservation of democratic institutionality and stability" -- several others were harshly critical. Nicaraguan President Daniel Ortega called Rousseff's removal an "anti-democratic process that has cast a shadow on the reliability and strength of institutions." Bolivia's Foreign ministry said Rousseff's opponents were trying to "destabilize democratic processes and ignore the will of the people expressed in the popular vote." Three Latin American countries -- Venezuela and El Salvador on May 14, and Ecuador today, May 18--announced they were recalling their ambassadors from Brazil, one of the strongest expressions of disapproval a nation can take. Salvadoran President Sanchez Ceren said he would not recognize the government formed by Vice President Michel Temer after Rousseff's removal. "We respect democracy and the people's will," Ceren said. "In Brazil an act was done that was once done through military coups." Venezuelan President Nicolas Maduro labeled Rousseff's ouster a "coup," calling it "a grave and dangerous sign for the future stability and peace of all the continent." 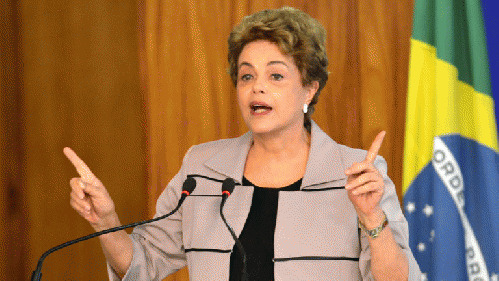 The region's major multilateral organizations have also been critical of Brazil's process. Secretary General Ernesto Samper of the Union of South American Nations, representing the continent's 12 nations, called Rousseff the "legitimate leader" of Brazil. Samper, the former president of Colombia, said the attempt to remove her was "compromising the democratic governability of the region in a dangerous way." "Our Organization has made a detailed analysis of the impeachment process against Dilma, and has concluded that it does not fit within the rules that govern this process. "There is no criminal accusation against the president; rather she has been accused of the poor administration of public resources in 2014. This is an accusation that is political in character, and that does not merit an impeachment process." A Nexis search turns up no US newspaper that reported on the recall of the Venezuelan or Salvadoran ambassadors -- and Google News shows no US coverage today of Ecuador's move. Samper's comments do not seem to have been covered by any US paper. Almagro's statement wasn't quoted by any US papers, though his criticism was briefly alluded to in a handful of stories (New York Times, 4/14/16; LA Times, 4/16/16; Washington Post, 5/12/16). These omissions are perhaps not surprising, given that most US news coverage of Latin America is strongly guided by the attitudes of the US government. And Washington seems amenable to regime change via legislative action for leftist governments in Latin America: After Honduran lawmakers ousted President Manuel Zelaya, then-Secretary of State Hillary Clinton worked for international recognition of the coup regime, as her published emails revealed. Questions have also been raised about a US role in the legislative overthrow of Paraguay's President Fernando Lugo. If the US government is happy with legislatures overthrowing presidents in Latin America, most US journalists will not go out of their way to indicate that not everyone in the region is celebrating. People who work for an industry that so predictably suppresses news that's unfavorable to the official narrative maybe shouldn't be so quick to mock others for "leaping." *Jim Naureckas is the editor of FAIR.org. He can be followed on Twitter: @JNaureckas. Iran Doesn't Have a Nuclear Weapons Program. Why Do Media Keep Saying It Does?